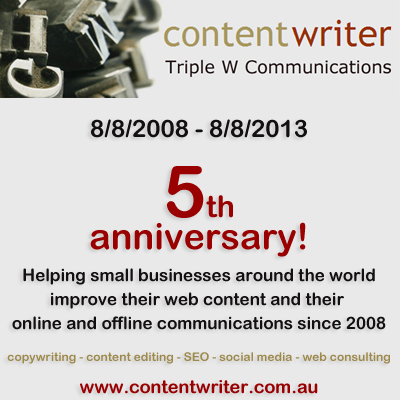 08/08/08 – Auspicious day to start my new Web Copywriting business! It’s almost 08/08/08… my very last day working for Coffs Harbour City Council and the official start of my new Content Writer business. True, I have been writing content and creating websites ‘on the side’ ever since I learned to hand-code HTML back in 1999. But this is the first time I’m going to be doing this officially as part of our own company (Triple W Communications) and fulltime! Having spent 8 years in South-East Asia, I’m very aware that 08/08/08 is considered an incredibly auspicious date. So my business will be a great success! I am a positive person and I just know there will be enough work and I will love working from home and having more flexibility and time to enjoy beautiful, subtropical Coffs Harbour.